Al: [first lines - narration] Ever get so bored with your life, you're afraid your gonna do something stupid? And then you get afraid you're so far gone you can't even think up something stupid to do any more? Well last year when my wife and I split up, I decided to leave New York, thought I'd go to Seattle. Then I remembered, Seattle has even more serial killers than Long Island. Add that to the big coffee house scene, and you got a town filled with psychopaths - who are always awake. 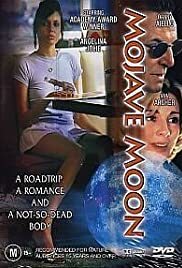 Before Angelina Jolie blew up front and centre, she got her start in some wild and wacky b movies and genre stuff, the weirdest of which has to be Mojave Moon. It's one of those low rent flicks where not much of anything happens, the characters meander in and out of a non-story and almost everyone is completely nuts. 'B movie dramedy' I suppose would be the specific sub-genre. The 'story', as it were, follows drifter Al (Danny Aiello), who meets pretty young Ellie (Jolie) in a diner and hitches a ride out to the desert for seemingly no reason at all. As Ellie takes a shine to him, he begins to fall for her mother (Anne Archer). Only problem is, her mom has a boyfriend played by Michael Biehn who is quite possibly one of the weirdest characters I've ever seen in a film. Volatile, berserkly unstable and constantly in near hysteria mode, it's an odd performance that off-sets the quirky tone straight into the twilight zone. That seems to be the idea here though, the dreamy desert climate having a strange effect on these folks, causing all kinds of outrageous behaviour and scenarios. The town offers a rogue's gallery of characters including Michael Berryman, Alfred Molina, Jack Noseworthy, Peter Macnicol, John Getz, Michael Massee and others, all of whom don't really do much other than show up, act weird for a bit and then wander off again. I like this type of film though, purposeless other than to languish about with characters who don't want much, their arcs sputtering in a flatline of small town doldrums and behaviour that only makes sense to them. It's not for everyone, which is why no one really gives credit to this stuff, but it's enjoyable once in a while, when you're in as strange a mood as the residents of this one horse sideshow of a town.